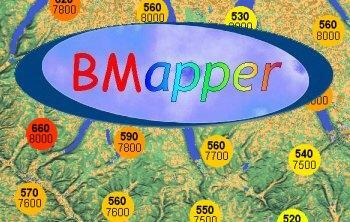 BMapper is a program that overlays BLIP data onto any geographic projection raster map (BMP format) with known coordinates. The program comes with background maps similar to the above map. Additionally, BMapper allows screen capture of the background map from other programs you may own such as SeeYou and Delorme.